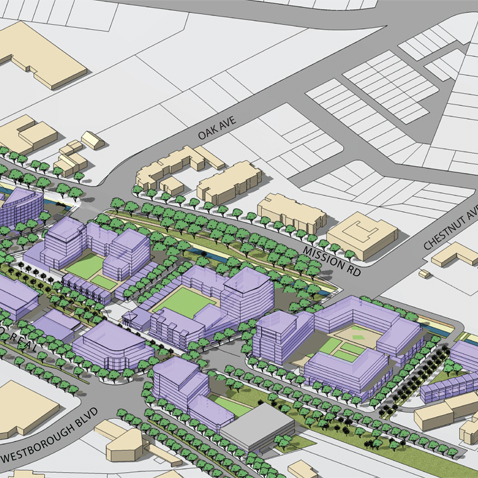 The 100-acre El Camino Real/Chestnut area will be a new walkable, distinctive, mixed-use district at the geographic center of South San Francisco, and one of the most pedestrian and transit-oriented places in the Peninsula. A network of open spaces will form the armature of new development. The BART right-of-way that extends through the length of the Planning Area will be transformed into a linear park and a pedestrian-oriented “Main Street,” lined with restaurants, cafés, and outdoor seating. Development will be at high densities, reflecting adjacent BART access. 15 acres of City-owned vacant land in the core provide a unique opportunity to establish a vision from the ground up. The plan envisions a new neighborhood of up to 4,400 residents housed in low- to high-rise buildings, along with nearly 450,000 s.f. of commercial and civic uses. It will provide a range of commercial uses; walking access to everyday amenities; new civic uses in a walkable setting. The plan includes a complete set of goals, policies, and critical implementation strategies, as well as design and development standards and guidelines, that will help achieve the desired vision. General Plan amendments and new zoning regulations—a mix of Euclidean and form-based approaches—were adopted concurrently with the plan.